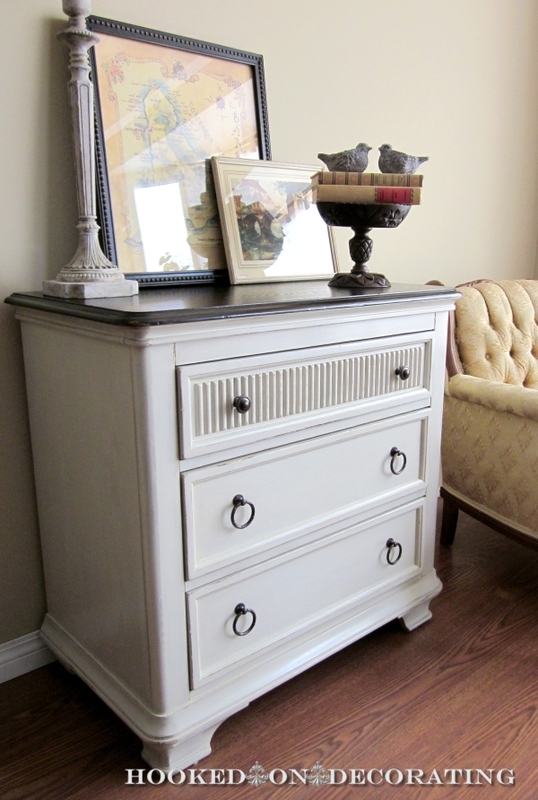 One thing that is pretty easy to find all over the internet are dresser makeovers. However once that dresser has been beautifully made over, how do you decorate the top? That goes for any dresser – new, used, made over or not. 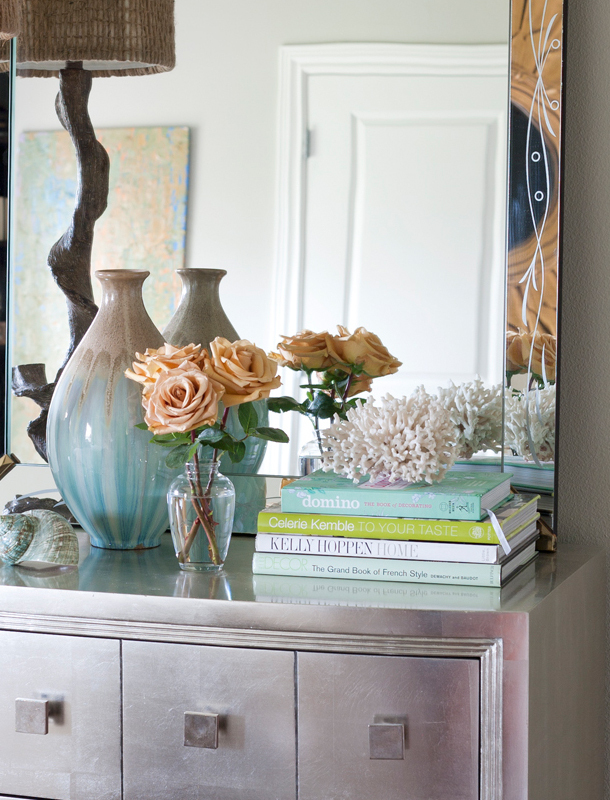 Decorating a dresser top helps to define the overall look. Some of the best help comes from looking at examples. 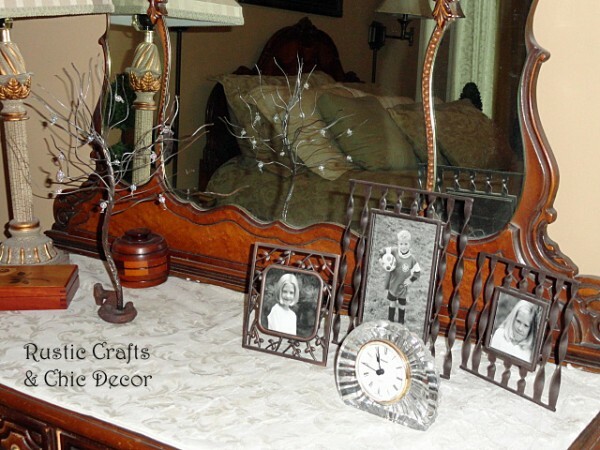 So, I have rounded up some of my favorite ideas on decorating a dresser top. Plus, I’ll show you a couple of thing that I have done. 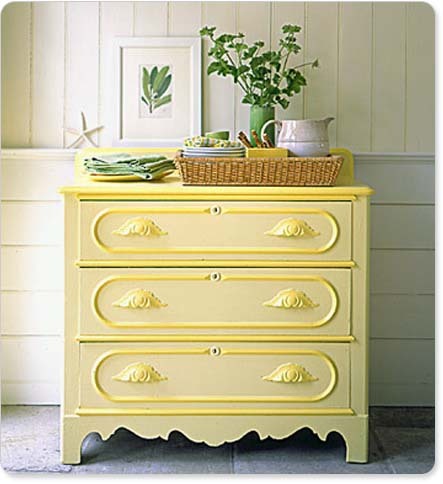 Maybe you will be inspired by one or more of the ideas for your own dresser. First, here is a look at my dresser in our master bedroom. I love having photos of my kids displayed! These are blasts from the past since my kids are all grown now. I kept the frames all similar. The funky metal tree matches the color of the frames and the faux crystal on the tree match the clock. For a little contrast, the old jewelry boxes match the dresser. I know….I’m a little matchy matchy but I find it calming. I like the fresh feel of this dresser top. The wicker basket and plant can be incorporated in any room. With the other accessories, this looks like it is used in a kitchen. Book and vases are great to decorate with and this arrangement is so peaceful and romantic. I love how the colors go together too! This is a classy look that is perfect for either a bedroom or a more formal living room. I love those birds! If you find a theme that you like, you could really have fun with it. 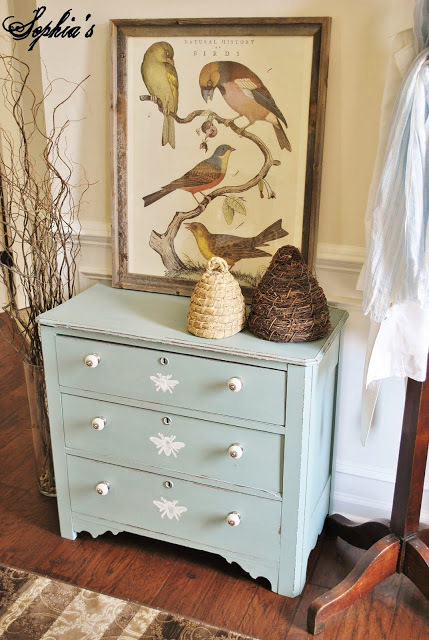 I am in love with this sweet honeybee themed dresser by Sophia’s Decor. Have you found some ideas to inspire you? What ideas do you have?